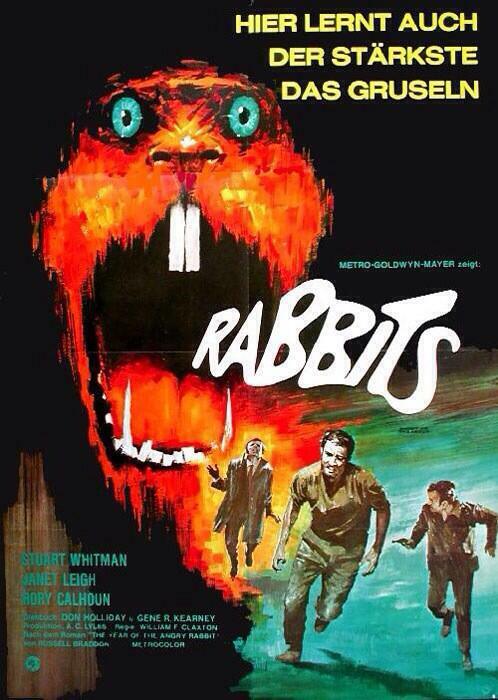 4-Word Review: Giant rabbits attack people. Arizona rancher Cole Hillman (Rory Calhoun) has his property overrun with rabbits and looks to zoologist Roy Bennett (Stuart Whitman) for help. Roy along with his wife Gerry (Janet Leigh) decides to inject these rabbits with hormones that he hopes will throw off their breeding cycle, but instead one of them escapes from the testing lab and creates a whole new race of giant sized rabbits that begin terrorizing and destroying everyone and everything around. If your thought is ‘what were they thinking’ as you read that plot synopsis then you are not alone as that was the question I kept asking as I viewed the film. What’s even funnier is that the studio feared this concept would be met with ridicule from the beginning and therefore created movie posters that carefully avoided showing the rabbits or explaining what the threatening presence was. 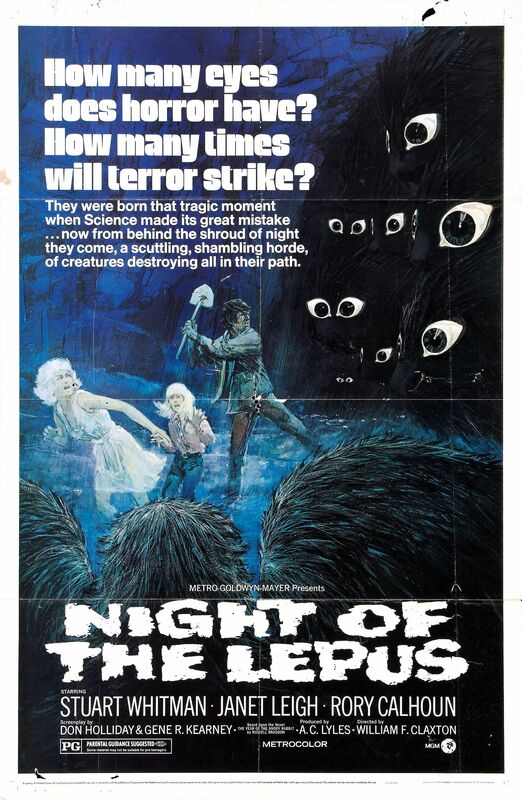 The original title for the film, which was ‘Rabbits’ was also changed to Lepus, which in Latin means hare as another way to avoid giving away the plotline, but it all proves futile because once people view the film the secret would be out and the laughter not the scares would begin. The special effects are the biggest issue as the rabbits never seem giant-sized and are simply photographed in extreme close-up to give the clumsy impression that they are large or shown amongst a miniaturized set. However, even when shown next to a small building it doesn’t work as they appear no bigger than a horse, which may make it big for that species, but still not giant sized. The sound effects used to represent the noise that they make comes off more like ancient tribal music that becomes increasingly annoying and overplayed. The shots showing the victims after an attack looks more like people lying on the ground smeared with red paint and without any bite marks or chewed flesh that you would expect. The film also doesn’t explain why these rabbits that are normally a docile type of creature would suddenly become so aggressive simply because they became bigger. It’s fun to see some familiar faces like DeForest Kelley in one of his last non-‘Star Trek’ roles, but I’m surprised that any of these actors took part in this as I’m sure from reading the script that they knew it was ludicrous, but to their credit they perform it earnestly. Melanie Fullerton as the young girl who sets the whole thing in motion by allowing one of the rabbits to escape is the only one that got on my nerves and may win the prize for most annoying child ever to be put on the big screen. Based on the novel ‘The Year of the Angry Rabbit’ by Russell Braddon the film never gets off the ground and is straddled from the very beginning by its absurd plot and cheesy effects. Even if it had been done as a parody I don’t see it doing any better, which brings us back to the first question ‘what were they thinking’ and my answer to that is that they clearly weren’t. This entry was posted in 70's Movies, Disaster Flicks, Horror, Movies Based on Novels, Movies with a rural setting, Sci-Fi and tagged DeForest Kelley, Entertainment, Melanie Fullerton, Movies, Review. Bookmark the permalink.